/ Modified nov 29, 2018 4:41 p.m.
A youth mariachi group perform at StoryCorp outside the Reid Park Zoo on November 19, 2015. An exploration of how some popular styles of border music came to be. Your browser does not support the audio element. Like many aspects of culture, music has been shaped by the blending of influences and history of the place it belongs. 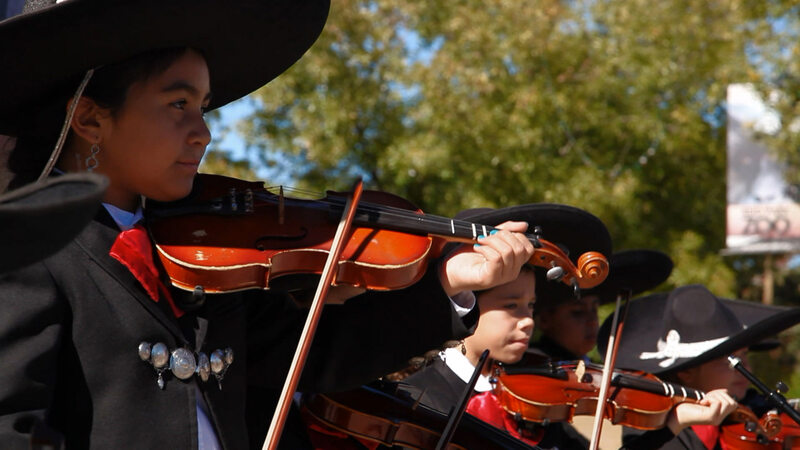 The rich confluence of traditions and conflict along the U.S.-Mexico border has given rise to several popular forms of music, including norteño, corridos and mariachi. Celestino Fernández, professor emeritus of sociology at the University of Arizona, focuses his research on Mexican immigration, education and popular culture, particularly music. In late October, Fernández gave a talk at the Fox Theatre in Tucson as part of the Soundscapes lecture series through the UA College of Social and Behavioral Sciences. On this week's show, Fernández joined us to expand on some of the aspects of his lecture. In addition to talking about the music, we hear excerpts of songs performed by Los Bañales Juniors, Guillermo Saenz and Mariachi Sonido de Mexico.